The release of iOS 11 also brings upgrade to iCloud storage, dropping the monthly price of 2TB storage plan down from $19.99 to $9.99. Good news, isn't it? Not exactly. For most users, they are hoping an upgrade to the free iCloud capacity. 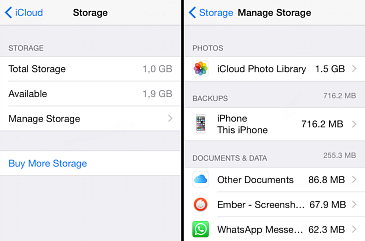 With other storage tiers stay unchanged on iCloud, users are still facing with the exhaustion of iCloud free storage. If you have not enough storage on iCloud with frequently popping-up messages like "iPhone cannot be backed up because there is not enough iCloud storage available", or "Not Enough Storage" don't rush to pay for the larger plan. Check this guide on how to free up storage on iCloud. The solutions here are 100% free and extremely easy, why not give it a shot? No further payment - an iCloud alternative service that will store and backup movies, TV shows, music, ringtone, recordings, photos, books, iTunes purchases, podcasts, and more content from iPhone to free larger storage on computer. Extremely fast and only drag and drop is required. Now the new monthly prices for iCloud storage tiers in US is as below. When you buy the larger storage, you will need to pay for it every month. It doesn't sound cost-effective. While the monthly bills are not expensive, they are unnecessary. When your iCloud free storage is full, the below free solutions will help you free up more space on iCloud. 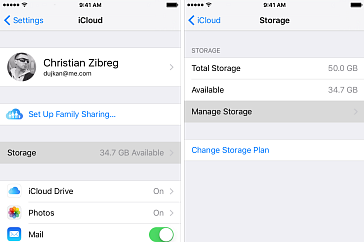 What to Do When You iCloud Storage Is Full? iCloud storage is occupied by stored data and iPhone and iPad backups. The backup is often large in size. And in most cases, it's the old backup that should be responsible for the problem with not enough storage iCloud available. So our guide on how to free up space on iCloud first starts with your iCloud backups. 4. To free up more space on iCloud, you can also disable the apps not important under the "Backup Options". Photos can take a log of storage and lead to iCloud storage full issue. In the list of apps that will backup data to iCloud under Manage Storage, the iCloud Photo Library is always the biggest item. With the app, iCloud will automatically upload photos to iCloud account and make them accessible from any iDevices. (Note that the photos are also part of iCloud backup, which means that the same photos will take double space on iCloud.) The 5GB limit can be filled up quickly with 4K, HD and Live photos and cause annoyances like photos not uploading to icloud anymore . 3. Store the large-size photos with other photo management solutions like Google Photos, Dropbox, or Flickr etc. Except the iPhone backup and photos that easily add up to a significant chunk of iCloud storage, the left settings contain the apps, documents, data and mail. Normal those items won't take too much storage on iCloud, but if you have not enough iCloud storage, adjust the settings for other stuff also helps. You can delete unnecessary apps, documents and data that you don't really need, remove junk and trash emails etc from the backup lists. It's also a good idea to backup iPhone without iCloud. "My iCloud storage is full after i tried all the tips... Help!!" 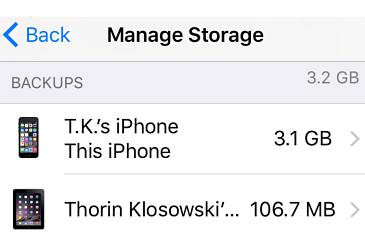 If you still have not enough iCloud capacity available, or the 5GB free iCloud storage cap is not big enough to backup your device, try third-party iPhone data manager. The manager called MacX MediaTrans is a great help. 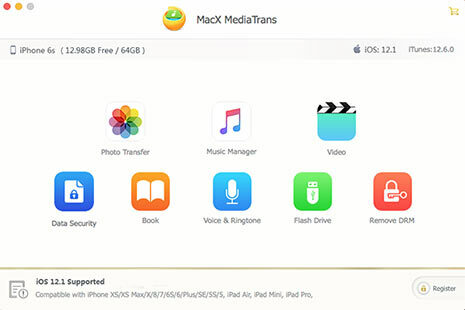 It will transfer and backup iPhone data, including videos, music, photos, recordings, ringtone, iTunes purchased items, books etc to computer when your iCloud storage is almost full. Mac version or Windows version. 1. Connect your iPhone or iPad to computer via USB cable and launch the iPhone manager. You're suggested to turn off iTunes auto sync to avoid any problem. 2. Click the option from the interface and select what you want to store on computer. You can store selective files or your whole library of music, photos, videos, etc. 3. Click Export and it will transfer your data to computer or your hard drive. You will no longer bother with iCloud storage not enough issues. 2. There are many other cloud services alternative to iCloud, for example, Google Photos, DropBox, One Drive, Amazon Cloud Drive etc. You can also try them all. Note that some are designed for photos only, and some others may also ask for a fee. iCloud offers a series of services, including iCloud offers numerous services, including iCloud Drive, iCloud Photo Library, Backup, iCloud Music Library, and Find my iPhone. If you're using some of them, you should know that some of them will also eat up iCloud storage. When it comes to how to free up storage on iCloud, also check those services to ease the iCloud gets full situation. * iCloud Photo Library - will save all the photos and videos you take to iCloud to allow free access from any iDevices. The size of iCloud Photo Library is very big and takes a lot of space for free storage on iCloud. * iCloud Music Library - iCloud Music Library is used to store your personal music online. But the music has nothing to do with the 5GB iCloud free storage space. 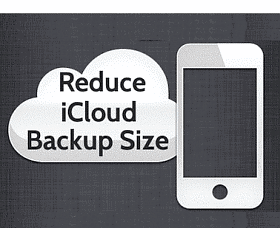 * iCloud Backup - it will backup your iPhone iPad and all the backups will go to iCloud storage. iCloud Backup also contains the photo part, which is already backed up to iCloud via iCloud Photo Library. * iCloud Drive - this service will save pdf, images, presentations and other files to iCloud. The data won't be large in size, but it also count against the storage of iCloud. Free download the world's fastest and easy-to-use iOS file manager when iCloud storage is full and transfer files on iPhone iPad iPod, including photos, videos, music, voicemail, books, movies, ringtones, audio and many more.